Operation Iraqi Freedom combat veteran Brian Sales carefully agitates large bins of food waste, paper products and coffee grounds. The bins of waste are latent with growing hungry worms which convert the waste into highly enriched soil for Sublime Soil located in Palm City. Brian Sales is fighting for his country by sowing the seeds of food independence. The Operation Iraqi Freedom combat veteran sees urban farming as his next national security mission. In January, he’s off to Wisconsin for a month-long urban farming boot camp with the renowned Will Allen, founder of Growing Power. 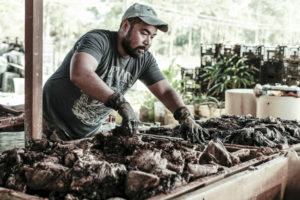 Sales is the director of operations at Palm City’s Sublime Soil. Dean Lavallee, owner of Park Avenue BBQ Grille, started the not-for-profit about seven years ago with a mission to completely eliminate landfill waste from his seven restaurants. Sublime Soil is involved in numerous recycling — what Sales and Lavallee call “upcycling” — projects, but the biggest is vermiculture. That’s a fancy word for worm farming. Republican Congressman Bill Posey, Rockledge, is hopeful the 115th Congress will be able to resolve ongoing Department of Veterans Affairs problems. He gave Veteran Voice an exclusive interview to discuss the coming session of Congress after the 2016 elections. 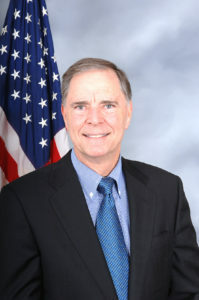 Congressman Bill Posey, Rockledge, thinks the 115th Congress has good opportunities to improve the Department of Veteran Affairs. The last couple years, he said, VA reforms have languished to death in the Senate. The Republican lawmaker was first elected in 2008, during a year when Democrats dominated the political landscape. No one would mistake him for being a fan of Barack Obama’s administration, which was swept into office in the same election. Posey got the nickname “Birther Bill” for proposing legislation requiring presidential candidates to provide their birth certificates. However, when reports about prolonged waits at VA medical facilities exploded in 2014 and many Republicans clamored for the removal of Secretary Eric Shinseki, Posey stuck by the former Army general.